Most of our possessions arrive in our lives almost by accident. Gradually, like falling snow, they accumulate around us until they form the basis for our identity. We do not intend this to happen. Most things we acquire are meant to increase our happiness and sense of fulfillment. But their uniqueness is quickly subsumed into the ordinariness of daily affairs. We wake up one day and find ourselves surrounded by possessions that mean nothing to us. Our freedom is gone; our lightness of being is gone. In their place is a sense of responsibility and ownership. We have become curators of our own cluttered reality. Unwittingly, we have allowed ourselves to be trapped by the thrill of the hunt. In our excitement we have forgotten that the pursuit of most possessions is nothing more than that — a pursuit — and have allowed ourselves to believe that our happiness will be increased by the next possession we acquire. But, in fact, our lives have slowly developed a sense of physical mass, and we are bound to the earth like stones. We must remember that most possessions are really butterflies that turn into caterpillars. They start with the wings of fantasy. We see them as freedom, as happiness. We believe they have the power to change our lives. We pursue them with energy and excitement. When we finally get them, they give us a moment of elation; then, like an echo, a feeling of hollowness comes over us. The thrill of ownership begins to grow cold in our hands. Still, swearing off possessions is not going to make us any clearer or wiser. Unless we want to dedicate ourselves to some higher ascetic ideal, it will only make us obsessed with our own poverty, and neither the self-absorbed poor nor the self-absorbed rich are doing themselves or anyone else any good. We need to find a true measure for our possessions so we can free ourselves from their weight without denying them their potential for good. We must always remember that possessions have no inherent value. They become what we make them. If they increase our capacity to give, they become something good. If they increase our focus on ourselves and become standards by which we measure other people, they become something bad. When we seek a possession, we should ask ourselves if it will make us better people, more able to share, more willing to give, more capable of doing good in our daily lives. Possessions that increase our own sense of self-importance are empty in comparison to those that help us contribute something of value to the world. Keep in mind that possessions are as likely to make you unhappy as they are to make you happy, because they define the limits of your life and keep you from the freedom of choice that comes with traveling light upon the earth. They are chameleons that change from fantasies into responsibilities once you hold them in your hand, because they take your eye from the heavens and rivet it squarely on the earth. If it is the thrill of pursuit you seek, recognize it. Embrace it and value it for the joy it gives you. But do not confuse the pursuit with the object being pursued. And when the objects accumulate, do what you must to free yourself from their false importance. Give away what you don’t use. Go on a long trip and travel lightly. Find a possession you value highly and give it to someone who would value it more. Do something to remind yourself that most of your possessions are nothing more than unimportant decorations on who you really are. Listen to the quiet wisdom that says you will value your possessions more if you have fewer of them, and that you will find deeper meaning in human sharing than in the accumulation of goods. A two-time winner of the Minnesota Book Award, Kent Nerburn is the author of many books on spirituality and Native American themes, including Letters to My Son, Small Graces, Neither Wolf nor Dog, The Wolf at Twilight, and The Girl Who Sang to the Buffalo. He lives near Portland, Oregon. Find out more about his work at kentnerburn.com. 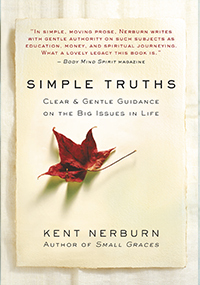 Excerpted from the book Simple Truths. Copyright © 1996 by Kent Nerburn.